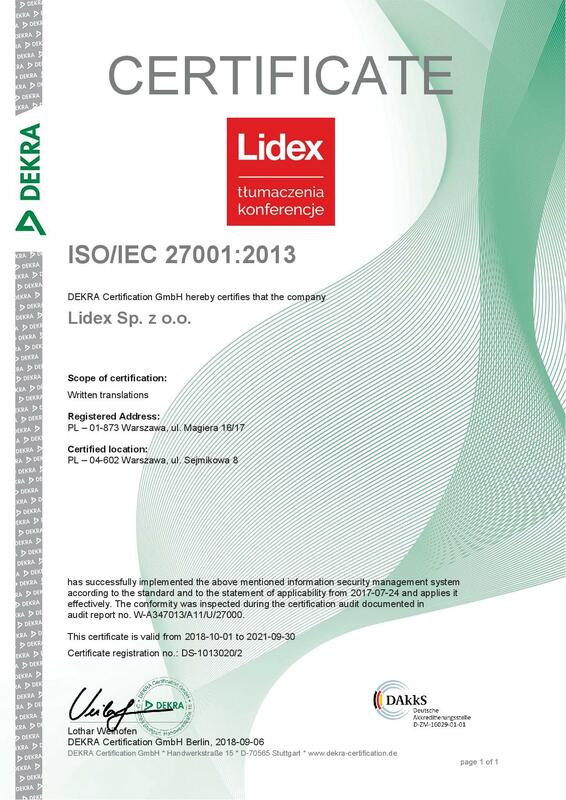 Only LIDEX can ensure that both your documents and communications remain absolutely secure; our company holds the ISO 27001 information security certificate. What are the benefits of becoming a regular Customer of the LIDEX Translation Centre? 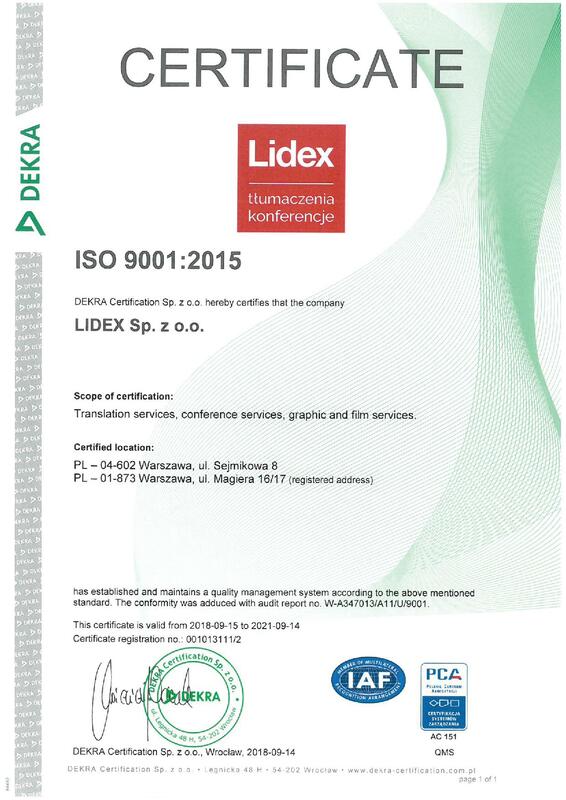 Only LIDEX can provide its Customers with a combination of 30 years of experience in the field of translations and the use of state-of-the-art CAT (computer-assisted translation) tools, graphic design software, the ITis proprietary database system as well as the LIDEX Customer Portal online platform. Our company offers translation services of utmost quality (we hold the ISO 9001 and ISO 17100 certificates). Our Customers benefit from a dedicated customer relationship manager, professional support of the Customer Service Department as well as attractive terms and conditions. No one else offers such comprehensive services in the Polish translation market! RELIABILITY We can handle the most complex and unusual assignments; whether you need a large-sized, multilingual translation performed on your own platform or a translation which involves a work of literature or requires an adaptation to the cultural needs of its end user – we will complete the assignment, no matter how short the deadline. SECURITY In order to allow our Customers to feel secure at all times, we have created a unique, comprehensive system which involves both IT and procedural measures and guarantees the authentic security of communication and information provided to us, at every single stage of the translation process. MORE BENEFITS FOR OUR CUSTOMERS LIDEX Customers can take advantage of the LIDEX Customer Portal, long and flexible working hours of the Customer Service Department as well as a dedicated customer relationship manager whose working with the Customer is streamlined thanks to ITis – our proprietary database system. 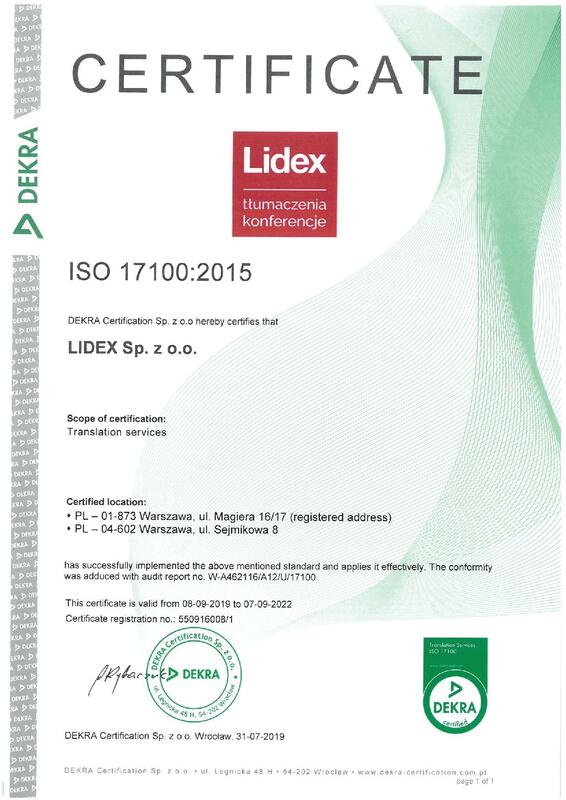 As a result, working with LIDEX and the performance of translation services is efficient, secure, and meets the Customer’s expectations.